A week ago, we left Yalova to go to Ankara for a few days, and then had a one hour plane flight to Bodrum. We stayed in Bodrum for about a week, in a beach resort called Bodrum Imperial, with my mom's side of the family with us. I will be doing a review of this resort. 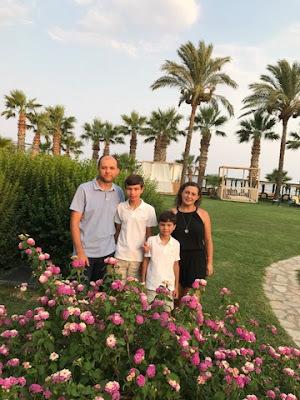 First of all, I would like to begin with saying that on last year's Turkey trip post for week one, we went to a resort called Hilton Turkbuku in Bodrum. I personally think that that place was better than here. (I gave the resort we stayed in last year a rating of 4.7 out of 5 stars.) The beach was better and warmer, as well as calmer, and the place looked fancier in general. I won't base this entire post off of comparing these two places to each other. I will look at this place in an unbiased view, regardless of how last year was. I will divide it into sections, and look at general pros and cons of each of them. My overall rating for this place is 4.4 out of 5 stars. Above: A photo of the beach shore and water. I didn't take it myself. 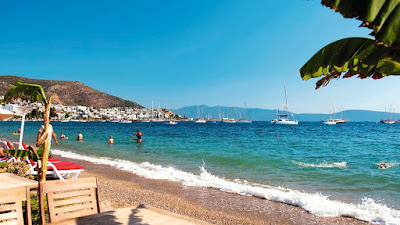 (source credit: http://www.firstchoice.co.uk/holiday/location/overview/Bodrum-area-001559) This image was clearly photoshopped in some ways, it hides the borderline floaters in the water. Also, this part is not edited, but the beach normally isn't wavy. It is very calm, like a gigantic pool, due to it being in a closed area. When I first saw the beach from a distance, I was kind of disappointed. This dissapointment turned out to be wrong. 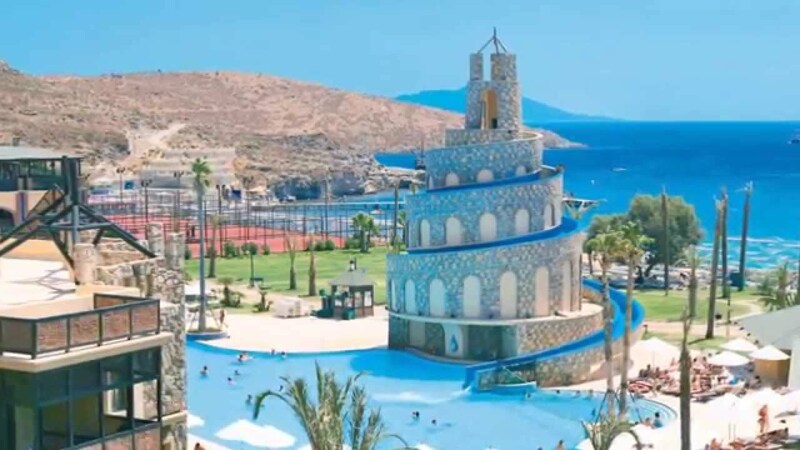 At first, I saw that even though the shoreline was very wide, the borderline looked very close to the shore and I was worried that it would be boring to swim in since I personally prefer farther borderlines (like in Hilton Turkbuku---completely irrelevant to this current review). This disappointment was completely disproved later. The beach is shallow for up to three-quarters of that length up to the borders. The last 25% or so of it is considerably deep. (Sorry, about constantly mentioning the place I went last year, I promise that this will be the last time that I do so; It turns out that last year, the beach had about the same area of which you can swim in. Think of it this way: last year at Turkbuku, the beach was a rectangle, less shoreline but more distance to the border, so it was tall ad skinny. Here at Imperial, it has a long shoreline and less distance to the border, so it was short and fat. Either way, they are the same size and shape: just tilt it around). There was only one deck in the middle in a shallow area, so there wasn't much of a place to jump off of or take a break while swimming at. I had fun swimming in it for the most part. The sand is nice and soft. I'm sure most people will enjoy it. The water itself is in the Mediterranean Sea. The water is calm (except when there is sight wind or a boat passes by), and is kinda chilly at first but when you get used to it a few moments later, it feels decently warm. There are some fish in it as well, most of which are very small. The biggest one I saw was the size of my hand, and the smallest, the size of my thumb. The beach normally isn't wavy. It is very calm, like a gigantic pool, due to it being in a half-closed area. Above: I didn't take this photo myself, I found it when I looked the resort's name up on Google Images. (source: https://youtu.be/lXW5mC5ncDo) It shows the pool and castle water slide. There were two pools, one was bigger than the other. The bigger one was better, not only because of its size, but because it also had a slide, and was next to the pool bar. The bigger one also had a volleyball net in it. The pools were actually very big, so there was plenty of space to swim around in. The castle that you see in the photo above not only had a slide circling around it like a snake, but had many other functions other than just having a slide. On the bottom layer was the pool bar, and they even had a... baby lobby next to it? (I don't get that part much either). The slide started from the top, and swirled around the castle like a snake. If you decide to ride it in a sitting position, you will go moderately quick, but it isn't too much for younger children to handle. If you decide to ride it on your back in a lying down position, then you speed down the slide like a bullet with super-speed. The pools and slide were fun, but if you want to go swimming, the beach is the highlight, not this. Above: My dad and cousin Alkim riding a jet ski. They had many sports and activities there. These included stuff like jet skiing, canoeing, and paragliding (you had to be 14 years or older to do paragliding). As for entertainment, they had a show every night. I found some of them kinda boring, but the acrobatics show was okay. The Turkish Folk Dance show was the best in my opinion, as it was the one that was performed the best and has a higher quality than the others. There was a daily schedule in certain areas that included yoga, dance, and workouts. There was also a kids club, meant for very small children. I sometimes saw them next to the pool, worshiping a guy in a Scooby-Doo costume doing the conga (or whatever it is that 4-year olds are into these days). But all jokes aside, their mascot was actually a guy in a Scooby-Doo costume (which looked more like a giraffe than a dog). Literally. Above: Sitting at the table, left side: Onur; right side: my dad behind, me in front. There was a main buffet, which was open for breakfast, lunch, and dinner, and had a different menu for each. There was also a normal restaurant, in which you could order Turkish food. The buffet was much bigger and had more food variety in it. In the buffet, many dinner nights had a theme based on a certain country around the world, and would decorate the place and have food based on that location. For example, they had Mexican Night, Asian Night, and my obvious favorite, Turkish Night. The food had nice variety each day, but not so much with the desserts. Disappointingly enough, they had pretty much the same selection of desserts every day. Anyways, I still really liked the food. The hotel room we stayed in was the standard-size bunkbed room. This had a queen-sized bed, along with a bunkbed next to it. This is the second best room choice that they had. The best one (and most expensive) was the deluxe family room, a 40-square-meter space with a separate rooms for different areas. The main room had a king-sized bed and TV, and another room had two smaller beds, another for a sofa with another TV, and the bathroom. Ours, the bunkbed room, was smaller. Onur and I had to share a bunkbed (better than last year, when we had to sleep together cramped on a tiny sofa). It was comfortable for the most part, and was pretty cool since I have never slept in a bunkbed before. (I got top floor, yay! Onur got bottom.) There was an extremely tiny balcony. We only saw a very limited view of the beach, unlike some rooms specifically meant for beach-viewing. They had a tiny TV in there, as well as built in Wi-Fi. I didn't particularly enjoy this resort's Wi-Fi system. They had three networks total: a free one for the lobby, a free one for the rest of the resort, and a paid one for all the hotel rooms. This is kind of weird, couldn't there just be one network for the whole place? The Wi-Fi for the rooms was overpriced, I think that it was around like 60 euros per week. The free network for the rest of the hotel had a very weak signal, and was disabled as soon as you walked into a hotel room. The best free Wi-Fi was the one in the lobby, it had the strongest signal. The priced ones in the hotels rooms may be better, but I don't know since I never tried it since we didn't buy it. You can view info about each type of hotel room and book at the official Imperial Bodrum page on TT Hotels' website. Above, from left to right: Onur, me, my mom; Taking a picture on a toy raft in the water. I hope you guys enjoyed reading this post! I came back from Turkey at the beginning of the week. Now that I am back, I plan on making at least one post per day. Be sure to view daily and share with others to see new posts! I am currrently at 95 thousand views. Can I reach 100 thousand views by the end of the month? See you in the next post! BBYYYYYYYEEEEEEE!!! !